Zachary Dorholt and Les Green, both of St. Cloud, and Natalie Ringsmuth of Waite Park were elected to three seats on the St. Cloud school board in the Nov. 6 general election. They outpolled the other three of six competing candidates – Peter Hamerlinck and Larry Hosch, both of St. Joseph; and Beth Schlangen of St. Cloud. There were 531 write-in votes. On the morning of the election, 53,649 residents of the district had registered to vote in its 21 precincts. 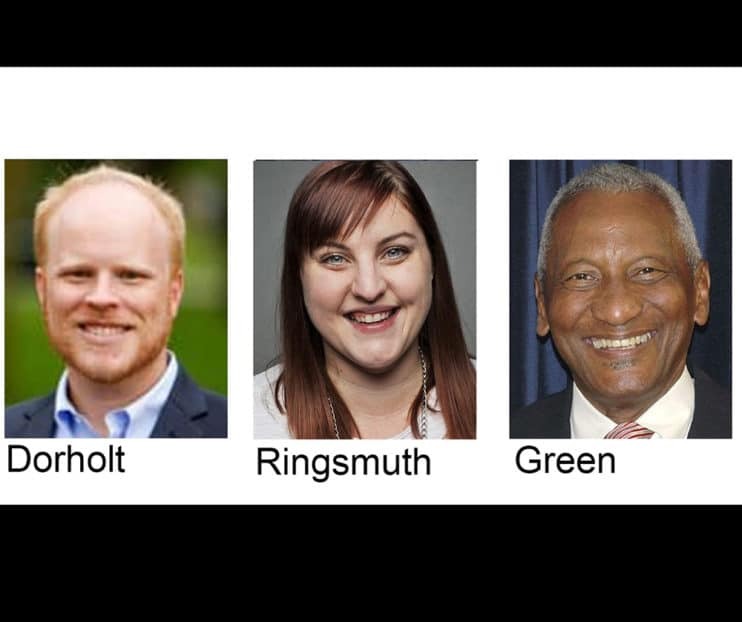 In the Aug. 14 primary election, nine contenders were winnowed down to six for the general election. Those who did not make the final cut were Scott Andreason, Thomas D. Kufalk and Kathleen Steiner. Zachary Dorholt, a former legislator for House District 14B, is employed by CentraCare Health in its Coordinated Care and Jail Medicine Program. He is also a small-business owner. Green was a St. Cloud school board member from 2006-2016. He has been a faculty member of St. Cloud State University, St. John’s University and the College of St. Benedict. Ringsmuth is the founder of Unite Cloud, a local nonprofit organization that promotes cultural, racial and religious understanding. She is a member of the charter school STRIDE Academy’s school board, currently as vice president. She is also a legal assistant for Tripiciano Immigration Law Firm based in St. Cloud.